… until I upgrade to the model with a six pack engraved in the rubber! Or, the story of my first time swimming with a wetsuit. 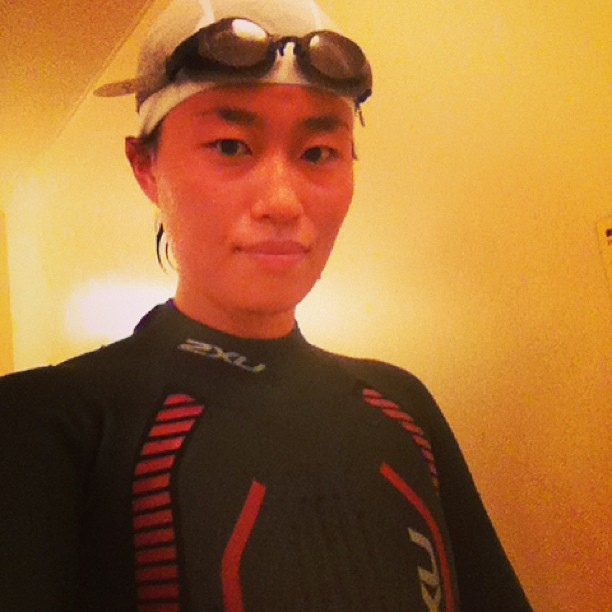 Today, I went shopping for my first wetsuit. The staff asked for my height and weight, and handed me one to try. It took twenty minutes of squirming in every direction possible to get it on. Limbs were flying everywhere. Rubber sticks. By the time I pulled up the zipper, I was sweaty and tired. This was strenuous activity! Once the suit was on, the fit felt fine. It’s like being squeezed into a tube. I have a fairly average build, which is usually unexciting, but a blessing in situations like these. Most of the negative reviews I checked online beforehand were about fit. Long torsos, big thighs, short arms etc. The store only had one model, which was actually a relief. This one was good. I ran home in the pouring rain, put on some music and turned the stopwatch on. This was a workout. Changing into a wetsuit, for time! The lubricant that I’d picked up didn’t make it noticeably easier but this time, it took 13:38. Exhausted once again, I flopped on the bed and googled what the heck I was supposed to do with the long chord in the back that helps with the zipper. It seems most people just leave it hanging. Okay then. I walked to the pool in the rain. Having an umbrella and a wetsuit seemed weird, even if I was wearing clothes in between. Once in the water, the restriction around the shoulder area fatigued my upper body very quickly during the warmup. This was really worrying, until it went away after the first 200m. It was basically an exaggerated version of my normal shoulder creakiness that needs to be worked out before beginning the workout. Phew. I really need to look into some pre-swim shoulder stretches. The extra buoyancy didn’t affect me as much as I’d expected, as far as the freestyle goes. Kicking for the breaststroke became a lot harder to do efficiently. I expect to revert to breaststroke at times during the race to rest and deal with the waves, so I’ll add this to my training next week. A lady in the next lane started to make conversation and reached over to touch my rubber. Oh boy. She was amazed at my speed and actually, so was I! I was clocking in around 40s for the hard 50m laps, which is a really good time for me. I’ll check what my swimsuit 50m time is tomorrow but it’s probably around 45-50s. The last 400m in today’s workout felt smooth so I upped it to 600m. It shows how much energy the wetsuit is saving! Quickly pulling off the wetsuit is actually part of the workout but I took it easy today, taking note of what was going on. Pulling the suit off the arms and legs by letting it roll inside out seems to be the quickest way to get out of it. To get the suit past the waist, just sucking in the gut and pushing the suit down in one go did the job. Also, I found that a dripping wet wetsuit adds 2kg to my weight. Huh. Sidenote: I’m experiencing so many ‘firsts’ throughout training for this triathlon. Capturing a few of them seems like a good idea, and I want to blog about it more. I’ve also started an Instagram account. Yes, after all these years. Follow Tomomiq for training related pictures!